Last Updated: April 17, 2019 · Published: July 2, 2018 By: Asian Caucasian Leave a Comment This post may contain affiliate links or sponsored content. 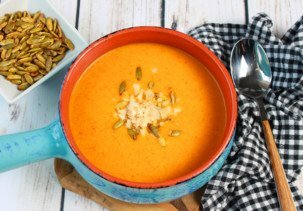 This soup screams summer! My Mean Green Gazpacho is light, cool, and refreshing. So much goodness in one bowl, and super easy to make! I threw lots of green veggies into a food processor and it was to die for! I have so been craving a good gazpacho soup and thought I’d turn the ordinary into a mean green version. On hand: avocados, cucumbers, green tomatoes (or tomatillos), yellow bell pepper (’cause I hate green peppers! ), green onions, basil, cilantro, and baby spinach. You could rifle through your fridge and throw in other veggies that you have on hand so don’t feel committed. 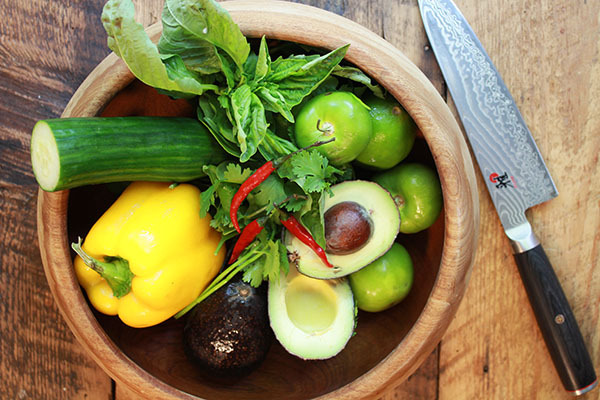 The best is the avocado oil which gives it a nice flavor, and the kick from Thai chili peppers. You can use jalapeño peppers if you can’t find these. Just make sure to seed the chili peppers (and don’t use bare hands)! So, are you ready to make and serve this super easy Mean Green Gazpacho soup? Your friends will be “green” with envy! This super easy Mean Green Gazpacho soup is the perfect summer starter, so light and refreshing! I used every green veggie under the sun to make this chilled and summery soup. Look through your fridge to see what you have on hand. It’s all good! 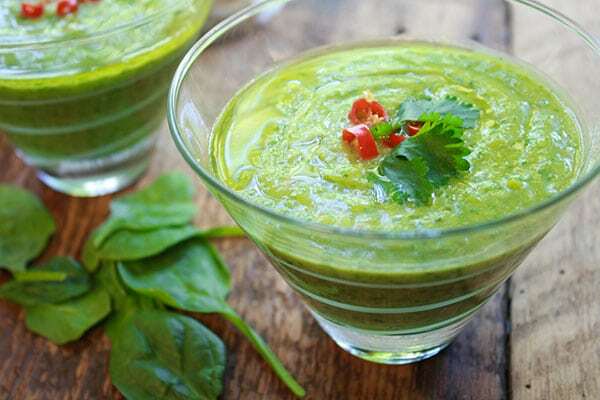 Everything goes into the food processor, it’s that easy to make this Mean Green Gazpacho! Done in 15 minutes or less! 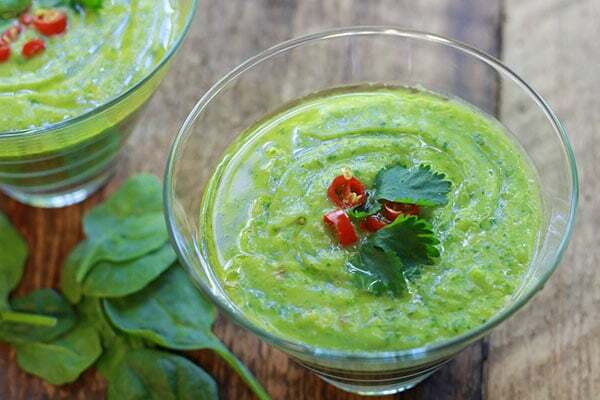 Your friends will be “green” with envy when you serve them this super light and delicious green gazpacho! Don’t forget to snap a pic and tag @asiancaucasianblog if you make this soup! 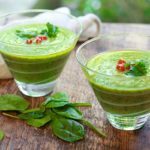 This Mean Green Gazpacho soup is loaded with healthy green goodness, the perfect summer soup for dining al fresco! In a large food processor, add all of the ingredients and pulse until puréed and smooth (chunky is good too!). Work in batches if using a smaller food processor. Taste for seasoning and chill in refrigerator for about 30 minutes or until ready to serve. Garnish with a drizzle of avocado oil, a few slices of Thai chili peppers (or slices of jalapeño pepper), and chopped cilantro. 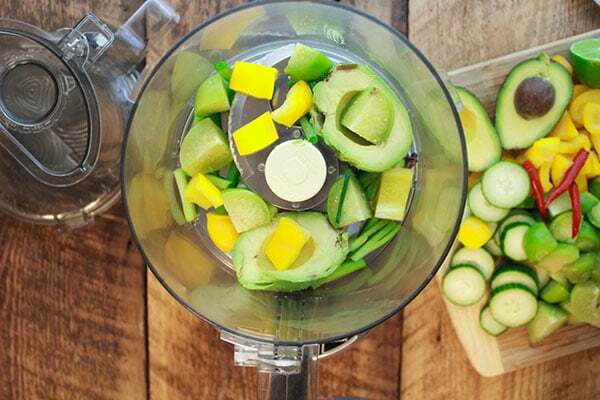 You can use a good blender if you don’t have a food processor. Work in batches when using a blender.